Scientists used to say in the past that only matter existed, nothing else. Great systems of philosophy arose based on the concept that only matter existed. But even those who believed that matter existed had to concede that there was something like consciousness. Then what was it? They said that consciousness was just an epi-phenomenon, just a by-product of matter. It was nothing but matter in disguise, something very subtle but still material. But this half century has seen a very great miracle happen. Scientists tried and tried to find out what matter was, but the more they tried, they more they came to realize that there was nothing like matter. Matter was analyzed and it was found that it had disappeared. Nietzsche had said just a hundred years before, “God is dead.” With God dead there can be no consciousness because God means the totality of consciousness. But within a hundred years matter is dead – and it is dead not because religious people believe it so but because scientists have come to a definite conclusion that matter is just appearance. It appears to be as it is because we cannot see very deeply. If we can see deeply it disappears, and then energy is left. This phenomenon of energy, this non-material energy force, has been known by mystics since long ago. In the Vedas, in the Bible, in the Koran, in the Upanishads – all over the world mystics have penetrated into existence and have always concluded that matter is just an appearance; deep down there is no matter, only energy. With this science now agrees. And the mystics have said one thing more which science has yet to agree with – but with which it will have to agree one day! The mystics have come to another conclusion also. They say that when you penetrate deep into energy, energy also disappears and only consciousness remains. So these are the three layers. Matter is the first layer, the surface. If you penetrate the surface then the second layer becomes apparent: you can perceive the second layer which is energy. Then if you penetrate energy, the third layer becomes illumined – that third layer is consciousness. In the beginning, science said that mystics were just dreaming, because science saw only matter and nothing else. Then science tried to penetrate, and the mystics’ second layer was uncovered: matter is just apparent – deep down it is nothing but energy. And the mystics’ other claim is: penetrate more into energy and energy also disappears, then there remains only consciousness. That consciousness is God. That is the deepest-most core. If you penetrate into your body, these three layers are there. Just on the surface is your body. The body looks material, but deep down there are currents of life, prana, vital energy. Without that vital energy your body would be just a corpse. It is alive, with something flowing in it. That flowing ‘something’ is energy. But deeper, still deeper, you are aware, you can witness. You can witness both your body and your vital energy. That witnessing is your consciousness. Every existence has three layers. The deepest is the witnessing consciousness. In the middle is vital energy and just on the surface is matter, a material body. This technique says, this consciousness exists as each being, and nothing else exists. What are you? Who are you? If you close your eyes and try to find out who you are, ultimately you are bound to come to a conclusion that you are consciousness. Everything else may belong to you, but you are not that. The body belongs to you, but you can be aware of the body – and that which is aware of the body becomes separate. The body becomes an object of knowledge and you become the subject. You can know your body. Not only can you know, you can manipulate your body, you can activate it or make it inactive. You are separate. You can do something with your body. And not only are you not your body, you are not your mind either. You can become aware of your mind also. If thoughts move, you can see them, and you can do something with them: you can make them disappear completely, you can become thoughtless. Or, you can concentrate your consciousness on one thought and not allow it to move from there. You can focus yourself on it and make it remain there. Or, you can allow a river like flow of thoughts. You can do something with your thoughts. You can even dissolve them completely until there is no thought – but still you are. You will know that there are no thoughts, that a vacuum has come into being; but you will be there, witnessing that vacuum. The only thing you cannot separate yourself from is your witnessing energy. That means you are that. You cannot separate yourself from it. You can separate yourself from everything else: you can know that you are not your body, not your mind, but you cannot know that you are not your witnessing because whatsoever you do you will be the witness. You cannot separate yourself from witnessing. That witnessing is consciousness. And unless you come to a point from where separation becomes impossible, you have not come to yourself. So there are methods by which the seeker goes on eliminating. 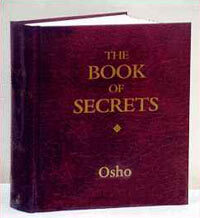 He goes on eliminating – first the body, then the mind, and then he comes to the point where nothing can be eliminated. In the Upanishads they say, neti, neti. This is a deep method: “This is not, that is not.” So the seeker goes on knowing, “This is not, this is not me, this is not I.” He goes on and on until ultimately he comes to a point where he cannot say. ”This is not I.” Just a witnessing self remains. Pure consciousness remains. This pure consciousness exists as each being. Whatsoever is in existence is just a phenomenon of this consciousness, just a wave, just a crystallization of this consciousness – and nothing else exists. But this has to be felt. Analysis can be helpful, intellectual understanding can be helpful, but it has to be felt that nothing else exists, only consciousness. Then behave as if only consciousness exists. This incident became a transforming phenomenon in his life because for the first time he became aware that everything is really a crystallization of consciousness. If you cannot see it, it is because you are blind. If you cannot hear it, it is because you are deaf. There is nothing the matter with the things around you. Everything is condensed consciousness. The problem is with you – you are not open and sensitive. This technique says, this consciousness exists as each being, and nothing else exists. Live with this notion. Be sensitive to this and wherever you move, move with this mind and this heart – that everything is consciousness and nothing else exists. Sooner or later, the world will change its face. Sooner or later, objects disappear and persons start appearing everywhere. Sooner or later, the whole world will be suddenly illumined and you will know that you were living in a world of dead things just because of your insensitivity. Otherwise everything is alive – not only alive, everything is conscious. Everything deep down is nothing but consciousness. But if you leave it as a theory, if you believe in it as a theory, then nothing will happen. You will have to make it a way of life a style of life – behaving as if everything is conscious. In the beginning it will be an ‘as if’, and you will feel foolish, but if you can persist in your foolishness, and if you can dare to be foolish, soon the world will start revealing its mysteries. Science is not the only methodology to use to enter the mysteries of existence. Really, it is the crudest methodology, the slowest. A mystic can enter existence in a single moment. Science will take millions of years to penetrate that much. The Upanishads say that the world is illusory, that matter is illusory, but only after five thousand years can science say that matter is illusory. The Upanishads say that deep down energy is conscious – science will take another five thousand years more. Mysticism is a jump; science is a very slow movement. The intellect cannot jump; it has to argue – argue every fact, prove, disprove, experiment. But the heart can jump immediately. Remember, for the intellect a process is necessary, then comes the conclusion – process first, then the conclusion – logical. For the heart, conclusion comes first, then the process. It is just the reverse. That is why mystics cannot prove anything. They have the conclusion, but they don’t have the process. You may not be aware, you may not have noticed, that mystics simply talk about conclusions. If you read the Upanishads you will find only conclusions. When for the first time they were translated into Western languages, Western philosophers couldn’t see the point – because there was no argument. How do you reach this conclusion? What is the proof? On what premises do you declare, “There is Brahma”? The Upanishads don’t say anything; they simply come to a conclusion. The heart reaches a conclusion immediately. And when the conclusion is reached, you can create the process. That is the meaning of theology. Mystics reach the conclusion and theologians create the process. Jesus reached the conclusion and then the theologians – St. Augustine, Thomas Aquinas – they created the process. That is secondary. The conclusion has been reached, now you have to find the proofs. The proof is in the life of the mystic. He cannot argue about it. He himself is the proof – if you can see it. If you cannot see, then there is no proof. Then religion is absurd. Don’t make these techniques theories. They are not. They are jumps into experience, jumps into conclusion. Here you can listen to the discourse excerpt This Consciousness Exists as Each Being.